Kinslytravel.com is the website for Kinsly Travel, a travel agency in Gotham City. It was discovered on a rotating banner ad on Maidenavenuereport.com. Kinsly Travel has been a full-service travel agency in Gotham for over 25 years. Check with us for Getaway Specials each week!. 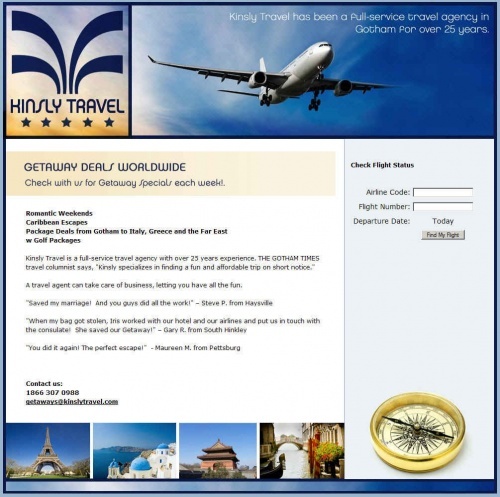 Kinsly Travel is a full-service travel agency with over 25 years experience. THE GOTHAM TIMES travel columnist says, "Kinsly specializes in finding a fun and affordable trip on short notice." A travel agent can take care of business, letting you have all the fun. Kinsly Travel! Plan your Getaway with us! Kinsly Travel has been serving Gotham’s travel needs for over 20 years! Now you can check flight status on our website. Your email is important to us, and we’ll do our best to get back to you. We specialize in personal responses and spur of the moment travel plans. We can make your getaway fast, efficient and fun! Thanks for calling Kinsley Travel, serving Gotham's travel needs for 25 years. Check our getaways deals out online. We can't take your call right now but leave your name and number and we'll get back with you and help you plan your own getaway. 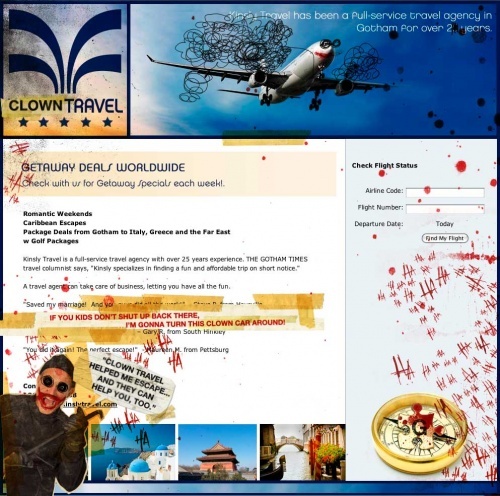 After the countdown ended on Whysoserious.com/Overture, Kinslytravel.com was "Jokerized," along with nearly every other website in the game. This page was last modified 06:10, 12 July 2008.